With vehicle components and technology evolving so rapidly, it's important that the college's Automotive Technical Services students have newer cars to work on… not your grandparents' 1976 Mercury Montego. That's why vehicle donations like the one announced on Jan. 9 are so important. Representatives from Mohawk Honda and the Eastern New York Coalition of Automotive Retailers (ENYCAR) were on campus to celebrate Mohawk Honda's gift of a 2013 Ford Escape to the college. With only 88,000 miles on it, the car will allow automotive students to troubleshoot and repair the advanced computer systems that older vehicles didn't have. "We're happy to be able to do something like this," said Travis Horne, director of service and parts operation for Mohawk Honda. "The students in this program are great, and we're glad that they can see a career path for themselves in this industry." That path, which begins in the college's automotive labs and classrooms, often leads to promising careers in the Capital Region automotive industry, he said. 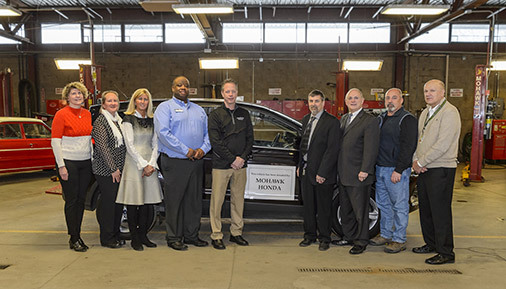 Kirk Austin, facilities and operations manager for Mohawk Honda, said the dealership employs five graduates of Hudson Valley's automotive programs, and that they hope to hire more in the future. "It's great to have a pathway that allows us to hire skilled mechanics and technicians," said Austin. "They're in demand. Hudson Valley graduates are a pleasure to work with. They have a good attitude and a great work ethic, and they're very respectful." The donation was made possible in part through the college's Foundation and the efforts of Automotive Technical Services assistant professor Randy Howarth, who sent letters to eight different dealerships in hopes of securing a vehicle donation. "I heard back from Kirk within a few hours, agreeing to donate, and he found us a car within two weeks," said Howarth. "We were more than happy to find out that the car was a 2013. This is very helpful for our students, so they can learn about repairing internal systems on newer vehicles. It's a welcome addition to our program, and we appreciate it." ENYCAR is a longtime supporter of Hudson Valley, and their contributions to the college's automotive program have been consistent for decades. Just last fall, ENYCAR donated funds to help the college purchase equipment for the automotive lab, and plans to continue to help the department get the equipment and vehicles it needs, as well as helping connect students and industry professionals in any way possible. "This is an exciting opportunity for us," said Kim Perrella, vice president at ENYCAR. "It's wonderful to be able to help students gain the skills they need to keep up with the latest vehicle technology, as well as help dealers in the automotive industry who have jobs that need to be filled." The college offers three programs in the automotive field: an Automotive Management A.A.S., Automotive Technical Services A.O.S., and Automotive Technical Services-Autobody Repair A.O.S. The programs serve nearly 200 students each year. Dealerships or individuals who are interested in discussing the donation of newer vehicles to the college's Automotive Technical Services program may contact Assistant Professor Randy Howarth at r.howarth@hvcc.edu or contact the college's Foundation.